Cornelius Balchin was the only son of James and Fanny Balchin, nee Millham, who married in 1878. In 1881 James and Fanny (both 27) were living in Smoke House Cottage, Shipley with their two children Frances Lucy (2) and Cornelius (2 months). James was working as an agricultural labourer. In 1891 he was working as a maltster and the family was living in Matravers Street, Arundel, Sussex and had been joined by Emily Kate (8). 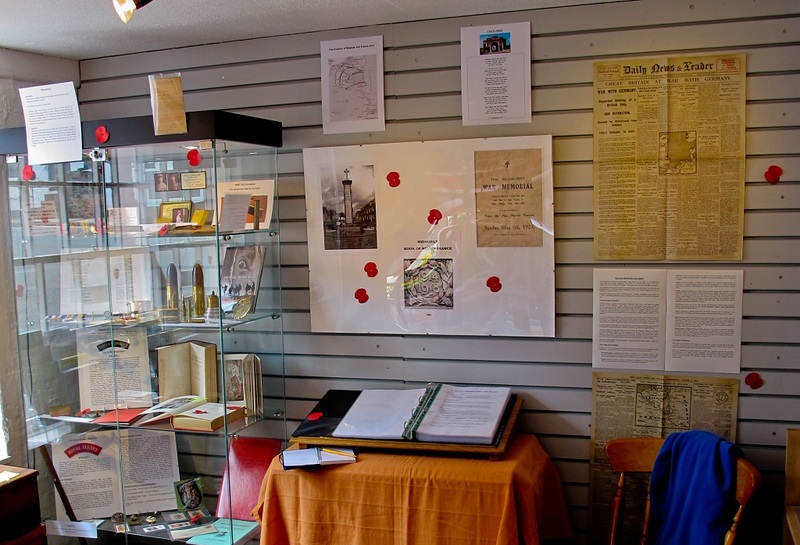 By 1901 James Balchin was a manager maltster and living with him in High Street, Billingshurst, Sussex, were his wife Fanny, Frances Lucy (22), Emily Kate (18) and Lucy Merritt (85), his mother-in-law. Cornelius Balchin married Beatrice Fanny Knight in 1909 and in 1911 she is listed on the census form as wife (26), 2 years married with no children and living at Loviseberg Barracks, Royal Field Artillery, 127th Battery, Royal Engineers and C, Bordon Camp, Bordon, Hampshire. In 1891 she had been living with her grandparents in Balcombe, Sussex and in 1901 she was in domestic service in Hove. There is no listing for Cornelius so it is assumed he was on active duty elsewhere. She and Cornelius subsequently had two sons, Richard James, born 11 September 1912 and Leslie Frank born 30 July 1914, both in the Amesbury district, Wiltshire. In 1911 James and Fanny Balchin, with Emily Kate (28) were living at The Maltings, High Street, Billingshurst and Frances Lucy Balchin (31) was working as a servant in The Red House, Effingham, Surrey. In 1918 she married Herbert G Worsfold. Cornelius Millham Balchin enlisted in Aldershott at 18 years of age. He was passed as fit at Guildford on 5 October 1898 and signed on for twelve years: seven years in the army and five in the reserve service. He served in India and South Africa before moving to France and Belgium in 1914. 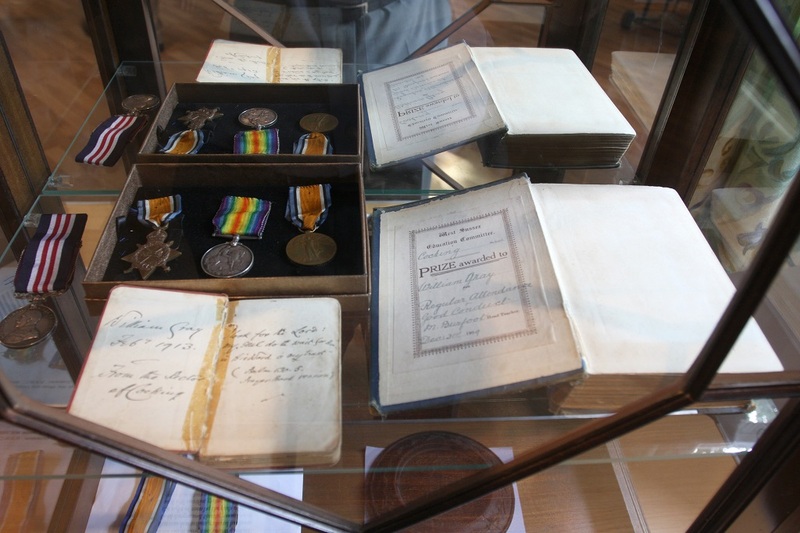 However, he was discharged as ‘no longer fit for war service’ on 20 November 1915. There appears to be some controversy in defining the cause of his illness but he was categorised as having ‘total disablement’, and was given a pension of 29/- for six months and 2/6 allowance for his children. The concluding sentence of his Pension Entitlement states – ‘a doubtful case but present condition may be regarded due to service since declaration of war. Incapacity total at present’. Cornelius said his disability dated from November 1914 when his horse fell on him at Ypres and he spent time in hospital at Versailles. The Royal Artillery was divided into two parts towards the end of the 19th century: Garrison and Field. The Field Artillery was further divided into Horse, Field and Mountain Batteries. The RFA provided artillery support for the British Army. They were numbered 1-103 and their depot was at Woolwich. A Battery was commanded by a Major, with a Captain as second in command. 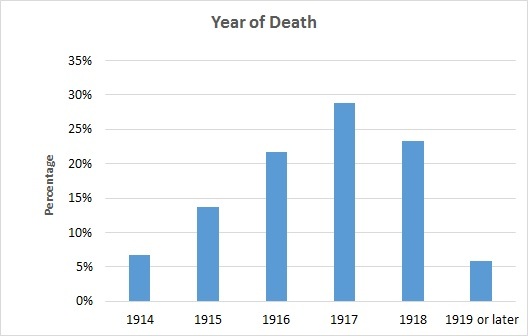 There was a final division, each led by a lieutenant with a detachment of two guns. The RFA was the largest arm of the artillery and was responsible for the medium calibre guns and howitzers which were deployed close to the front line. Cornelius Balchin died on 14 November 1919 at Netherne Asylum, Merstham, Surrey and his death was registered in the Reigate district. He was 38. His wife predeceased him. She died in March 1919, aged 34. 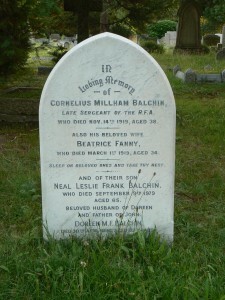 Cornelius Balchin is buried in Midhurst Cemetery, grave 562 and commemorated on a headstone, together with Beatrice Fanny, his son Neal (sic) Leslie Frank and daughter in law Doreen. 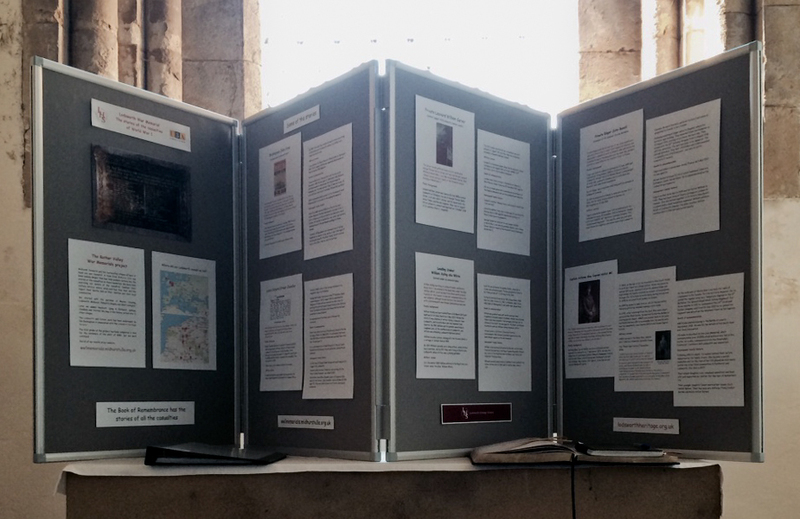 He is commemorated on Midhurst War Memorial and Memorial Panels in Midhurst Parish Church. 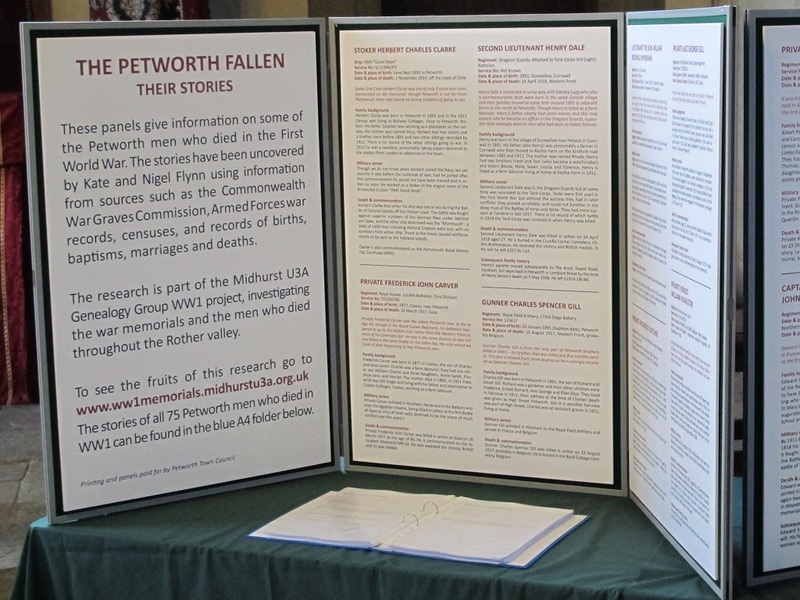 His mother, by then a widow, (James Balchin died in 1913, aged 59) was granted probate on 12 December 1919 for Cornelius Millham Balchin, an army pensioner of 3 Cobden Road, Midhurst, Sussex. 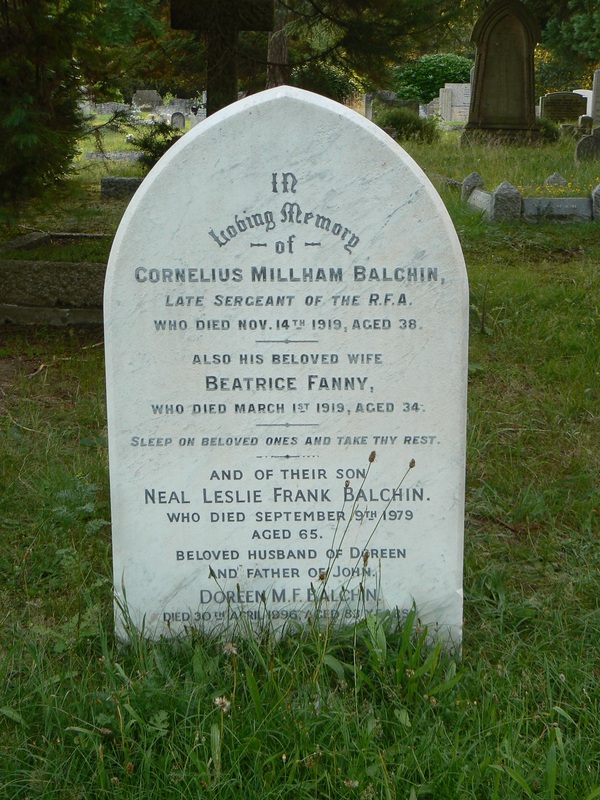 Fanny Balchin died 13 April 1921, aged 68, in Midhurst. Probate was granted to Emily Kate Balchin, Spinster, in the London district. Fanny was living in Rumbolds Hill, Midhurst at the time of her death. Frances Worsford (nee Balchin) died in 1949 in the North Surrey district. Emily Kate Balchin died in 1953, aged 70, in North Surrey district. Leslie Frank Balchin died 9 September 1979 in Sutton, Greater London. He was 65. Richard James Balchin died in December 1982 in Worthing. He was 70.